Tissue microarrays (TMAs) have become a common method for efficient management of tissue samples. For more general background about TMA application areas, visit our TMA information pages and links for key references to scientific publications involving tissue arrays. With the MTA1 and the ATA27 AlphaMetrix provides manual and automated solutions from Estigen/Beecher. The Paraffin Tape-Transfer system makes it possible to support and capture tissue sections and sections with the TMA cores intact and to transfer them to a slide. The tape-transfer process eliminates the water bath step which can be damaging the section or the cores in the section. The CryoJane Tape-Transfer System for Cryosectioning makes it easy to produce high-quality frozen sections of difficult tissues. The CryoJane uses adhesive coated slides and adhesive tapes to capture sections instead of using an anti-roll plate or brush. The Leica CryoJane is adaptable to virtually all cryostats on the market. ⇒ and is then transferred to a cold adhesive-coated slide. The adhesive on the slide is polymerized into a plastic layer, securely anchoring the still frozen section to the slide. The section on the slide is now ready for fixation and/or staining. Indispensable for sectioning Frozen Tissue Arrays. ⇒ manually operated high-precision arraying equipment. 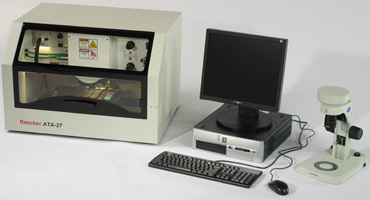 Skilled users can create arrays with more than 500 samples per slide with this unit. The Clini-RF is a new type of freezer designed to rapidly freeze specimens for sectioning or processing. It has a rapid freezer tank which can hold object holders as well as hexane for immersion of the specimens. ⇒ difficult-to-cut paraffin sections, sections that are poorly fixed or poorly infiltrated. Sections are immediately ready for deparaffinization. It is the preferred method for tissue microarray sections. The method eliminates the need for the water bath and drying step. ⇒ procedure from array construction workflow. After planning and designing the array layout using dedicated software, ATA-27 creates array blocks automatically using robotics to measure block heights, retrieve donor tissue cores, create holes in paraffin matrix and deposit tissue cores into holes.